We are in the midst of the bicentennial of the construction of the Erie Canal. It began on July 4, 1817, in Rome and ended eight years later with the Wedding of the Waters on November 4, 1825, in New York harbor. 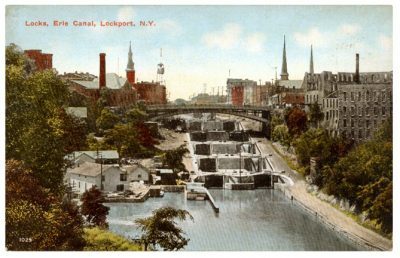 In 2017, the World Canals conference was held in Syracuse in honor of the commencement of the Erie Canal bicentennial. One would think that the eight-year commemoration provides ample time to develop Paths through History along the Erie Canal. There could be multiple paths as people returned each summer for another conference and tour. Forts Plain and Ticonderoga have annual American Revolution conferences with tours. The Erie Canal provides the same opportunity with the advantage that a different location along the Canal could be featured each year so people could experience the entirety of the Canal over the course of the bicentennial. And there would be plenty of chances for teacher programs at a variety of levels as well. Obviously that is not what has been happening. Since the number of awards is comparatively low, the awards are listed in alphabetical order by county and not by REDC region. This project seeks to create a historically accurate replica of the Seneca Chief, the packet boat that led the flotilla for the 1825 official opening of the Erie Canal. The boat will be built at the Inner Harbor in Buffalo in full public view. The Buffalo Maritime Center will use the project to develop programming with canal heritage partners to identify their Erie Canal history. It will culminate with a reenactment of Governor DeWitt Clinton’s voyage on the Seneca Chief from Buffalo to New York City. Clinton’s Erie Canal packet boat, which led the flotilla from Buffalo to NYC for the official opening of the Canal in 1825. The boat will be constructed in full public view, year round on Canalside. I included the NYSCA award since it directly relates to the Canal award. These two awards are directly connected to the Erie Canal bicentennial. The implication is that the New York State Canals Corporation is planning a bicentennial celebration of the opening of the Erie Canal and the Wedding of the Waters in 2025.
can be visited during a water trip and facilities for the entire Canal System. Signs will display a custom logo of the water trail along with directional arrows where necessary. They will complement the release of a new guidebook, a navigational map set and website updates that will identify launch points and trail blazers. This type of grant is typical of those awarded in this category: maintenance, refurbishing, and signs. This project will increase access to canalside attractions in the village of Fairport. On the north bank, new ADA-accessible docks will be installed, along with an accessible kayak launch, regraded boat ramp, observation desk, wayfinding, an information kiosk and new lighting and landscaping. Enhancements along the south bank include a new park that will feature an interpretive heritage trail to celebrate the Erie Canal bicentennial. The trail will connect to existing pathways in Kennelley Park and to downtown neighborhoods via an extended sidewalk network. The Village of Fairport will work with residents, businesses and other public and private stakeholders to prepare a Local Waterfront Revitalization Program (LWRP) for its Erie Canal waterfront. The LWRP’s vision, policies, and project recommendations will promote business development, enhance public access and recreational facilities, protect water quality, encourage development of underutilized waterfront lands, promote walkability and enhance quality of life. This enterprising municipality was able to parley three funding sources on related projects with two different names. This project, a key component of a $30 million brownfield revitalization development, will build an elevated pedestrian boardwalk and community space adjacent to the Erie Canal in Amsterdam. It will connect the Mohawk Valley Gateway Overlook to the downtown business district and Amsterdam’s historic South Side neighborhood. The boardwalk will reorient residents and visitors to the impact the Erie Canal had on the region and highlight the Mohawk River as a beautiful, natural amenity. Flight of Five locks in Lockport, by creating 14 lifesized bronze sculptures of those same lock tenders. They will be placed on the steps of the Flight of Five, which is undergoing restoration and rehabilitation efforts in the city. When I used that photograph in a post, several people responded requesting information about it. The restoration and rehabilitation are not part of an REDC award in 2018 or 2017. In 2014, which is as far back as I went in my research there was a grant related to this effort. The Restoration of the Flight of Five, the historic Erie Canal locks built in the mid-1800s in Lockport, is the centerpiece of a comprehensive economic development and downtown revitalization strategy called the Locks District Redevelopment Plan. The completion of the Restoration of the Flight of Five is expected to annually draw 230,000 visitors and generate $17 million in spending. ESD has several grant programs that together make available $150 million of capital grant funding for the Regional Economic Development Council Initiative. Capital grant funding is available for capital-based economic development projects intended to create or retain jobs; prevent, reduce or eliminate unemployment and underemployment; and/or increase business or economic activity in a community or Region. In 2016 I found two related awards for the Erie Canal Museum located at the Flight of Five Locks. Lock Tender Tribute involves the creation of state-of-the-art exhibits at the Erie Canal Museum at the base of Lockport’s Erie Canal locks to better interpret the cultural and historic resources in downtown Lockport. Clearly Lockport and the Lockport Locks Heritage District Corporation are working hard to maximize funding in the REDC process, have a long-term program, and have been receiving support from their REDC region on behalf of history or cultural heritage tourism. I wonder how many other municipalities are as well organized and successful. Towpath Trail and the Canalview Bridge Walk Trail. It will build upon work already completed in Fulton, such as the Indian Point Landing gazebo as well as the downtown Canal Landing marina, gazebo and park. The City of Ithaca will partner with a private developer, City Harbor LLC, to improve the Cayuga Lake waterfront. The project will include housing, a restaurant on the point across Cascadilla Creek, seawall construction and new boat slips. Ithaca will also develop a public promenade, a connector path to the Ithaca Waterfront Trail and electric car charging. The village of Newark will improve about 1.6 miles of Erie Canalway Trail that is currently too narrow, unpaved, lacks wayfinding signage and is susceptible to erosion. The trail will be widened to meet national design standards and be outfitted with lighting between the Edgett Road Bridge to the Port of Newark and downtown business district. Safety barriers will be installed along with new benches and bike racks. Measures will also be taken for slope and erosion control protection. In 2017, the Erie Canal was all the rage. I LOVENY was out in force promoting the World Canals Conference. The New York State Canal Corporation staff were present at Tourism Advocacy Day. Now in 2018, it is as if the Erie Canal vanished. No award by I LOVENY for 2018 even mentions the word “canal.” It’s as if the Erie Canal is Brigadoon and will not reappear until 2025…and then will disappear once again for a century. It is unfortunate the pride in Canal is not ongoing.